When planning your wedding, there are many things that you will learn from those around you. There are things that are nice to know and then there are things that you really need to know and will be glad that someone told you. 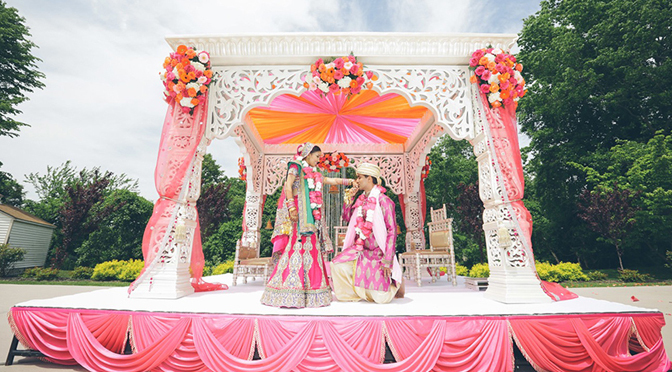 If you are still wondering whether there is something you might have missed here are few tips to planning the perfect Indian wedding in Long Island. Before confirming the venue, get a grip on the approximate number of guests you will be inviting to your wedding. This will make sure that there is enough space for your guests and the crew. As a rule of thumb, allow 20 to 25 square feet per guest. This may seem like a lot of space, but during the hustle and bustle of your wedding day it won’t seem like much. Planning ahead is essential to make your wedding day go smoothly. Find out beforehand if your wedding date falls on the same day as a public event, a business conference, or a charity fair that can affect the traffic and hotel room availability. Keep the weather and other potential hindrances in check. Guests usually skip out early from hot summer tent weddings and inadequately heated winter receptions. Mosquitoes and other insects can also be a problem in certain areas during certain seasons. If that is a problem consider renting pest control to get rid of this problem. You can take advantage of the high spending wedding period by signing up for a credit card with a rewards program or any such offer. Whether the rewards are air miles or shopping deals, using the card for all your wedding related purchase can help you save a lot of money that you can later use for something useful. The easiest way to cut down your wedding expenses is cutting down the guest list. Most of the wedding expenses go to wining and dining the guests. If it is costing you $50 per person, eliminating a table of ten will cut down $500. Be smart when you are planning the guest list. Probably the biggest expense on your Indian wedding day will be feeding the guests. Before signing any contracts make sure that you are not required to serve the vendors the same meal as the guests. For the wedding day menu, choose a less expensive but hearty meal plan that your guests enjoy. Common India wedding varieties include Paneer tikka, kebabs, and an assortment of curries. Your wedding vendors should be your go-to people as they are the most trusted wedding experts you know. When you are working with them, feel free to share everything you want and listen to their advice. The bottom line as that you should have an honest conversation with them about your event so that they can deliver accordingly. Their job is to tell you what they can or cannot do for you while staying within your wedding day budget.